'"The Gulf War was [not about oil]," Mr. Bush replied. when I was trying to have dinner." Proposition One is a grassroots voter initiative movement for disarmament of nuclear weapons and the conversion of the arms industries to human and environmental needs. The concept was proven viable by the victory of DC Initiative 37 in 1993, which inspired DC's Congresswoman Eleanor Holmes Norton to introduce a House Bill, "The Nuclear Disarmament and Economic Conversion Act" in 1994, 1995-96, 1997-98, 1999-2000, 2001-02, 2003-2004, 2005-2006, 2007-2008, 2009-2010, 2011-2012, 2013-2014, 2015-2016, and 2017-2018 sessions. Proposition One and similar ideas are gaining international support, especially since the United Nations nuclear weapons ban treaty of 2017. You can sign a petition to your Representative asking for co-sponsorship of Eleanor Holmes Norton's bill, and petition your Senators and the President to ratify the UN ban treaty, and learn more about Norton's bill here. Over the years the play of judicial games has resulted in transforming "constitutionally protected" free thought and expression into "criminal activity." The vigil has been one of few critical voices claiming that this transformation is irrational and factually unjustifiable. Upon retiring, Supreme Court Justice Thurgood Marshall noted, "This court no longer rules by reason, it rules by force." As if to illustrate Justice Marshall's premise, the Park's excellent adventure in the halls of justice sheds some light on how "national security," "aesthetics," and "official immunity" have effectively created a state where police vigilantism has become "official" business. shall not be construed to deny or disparage others retained by the people." (Annals, 1st Cong., 1st sess., I, 456). Many people felt that they already had the rights before they were written down, and writing them down gave those rights no more authority than already conveyed naturally. Over time, the Constitution has been shadowed by numerous regulations which seem to deny or threaten the individual rights our framers tried to protect. After finding refuge from ideological persecution in the wilderness of the "New World," the people who founded this country would be shocked at a current National Forest Service power/land grab. In September, 1995 the FS published a final "group use" rule to criminalize the assembly of more than 75 people without a FS permit in any National Forest. Although this rule might not seem to be a serious imposition for most people in this country, it is important to consider that NO PERMIT REQUIREMENTS PREVIOUSLY EXISTED TO RESTRICT FREEDOM OF ASSEMBLY IN THE NATIONAL FORESTS. Until this rule, and ever since this country began, every person has had the "right" to "peaceably assemble" in public forest lands. A "right" like assembly is and has always been distinguished from a "privilege," like driving. Our vigil is dedicated to the elimination of all weapons of mass destruction, as a first step towards peace. We have compiled a tremendous amount of information about disarmament in general, and nuclear weapons abolition specifically, which we would like to share. We have provided an index list to make articles, activists, and subjects easier to find. We also send information to subscribers to the daily "NucNews" - a survey of articles about nuclear, plutonium, uranium, and radioactivity issues - and recently have begun a NucNews Archive. 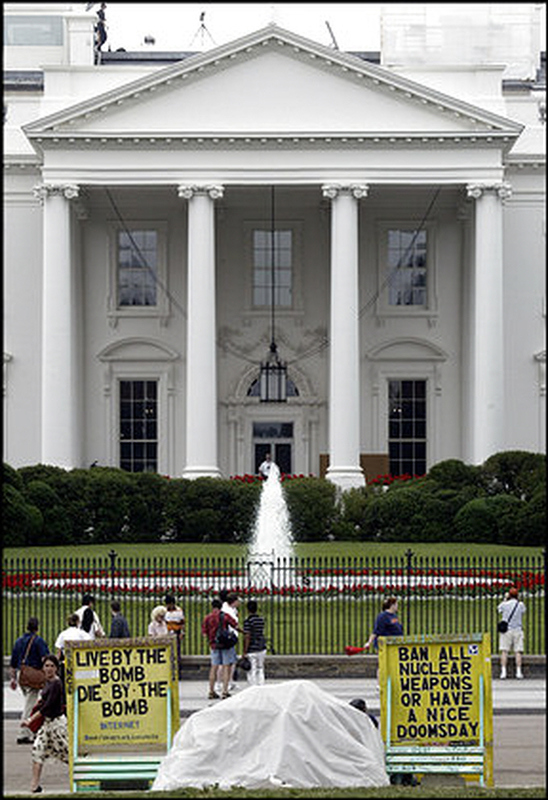 This Web Domain is created and maintained by volunteers of the anti-nuclear vigils in Lafayette Park, at 1601 Pennsylvania Avenue, since June 3, 1981. 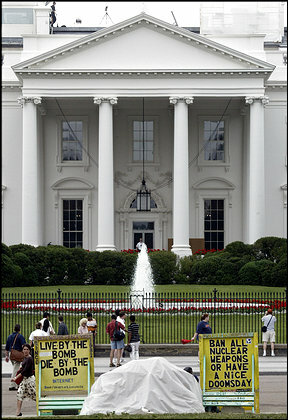 We exercise our First Amendment Rights by maintaining a 24-hour-a-day vigil in front of the White House. Contained in the Web Domain is information concerning the current Anti-Nuclear Movement, Protests in Lafayette Park, and encroachment on First Amendment Rights.